Your Instructions - Time to Mix it Up! 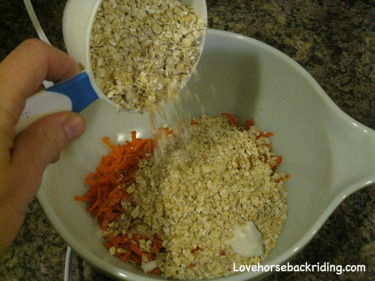 If you have been following along in one my all time favorite recipes for horse treats, you should be on step 3. You will have already gathered your ingredients, prepared and shredded the carrots, and preheated the oven. Now it is time to measure and add most of the remaining ingredients. I like to get everything in the bowl before I start mixing, you'll see why on the next page. 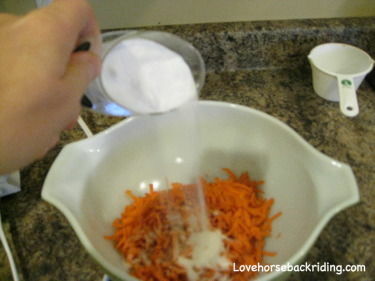 Start by adding 1 teaspoon of salt to the large mixing bowl with your carrots in it. 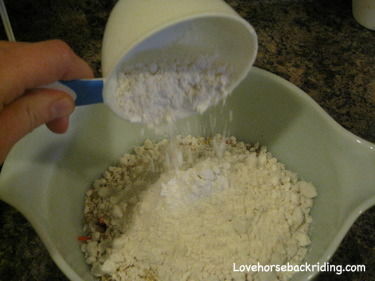 Next is 3-4 Tablespoons of granulated sugar. 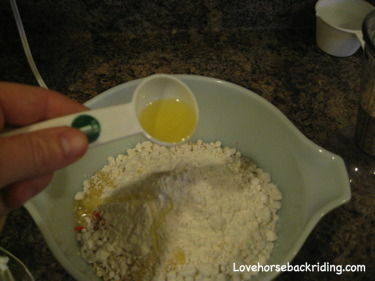 My current mare has a real sweet tooth so I lean towards 4 tablespoons. Next is 1 cup flour. I prefer an unbleached, quality flour. I have found that the lighter weight and bleached varieties don't turn out as well, but you can use whatever you have on hand. The corn oil adds a bit of crunch to the treats when they cook. 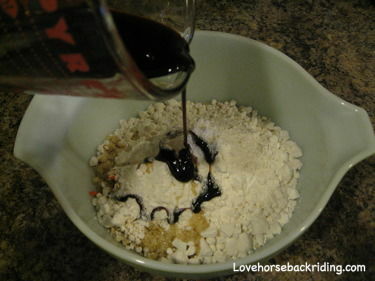 Horses love molasses, so it makes sense that you'll see it in many recipes for horse treats. Ok. 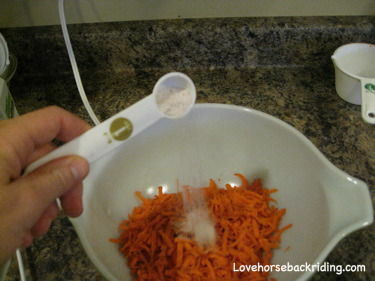 It's time for the most crucial step in these horse treats. I want it to be one of your favorite recipes too, so now you'll get the secret of how to make them perfect.